A typical day begins with me waking up in McDiablo's nice, comfy bed. Her quilt is so warm that I have trouble actually getting up! 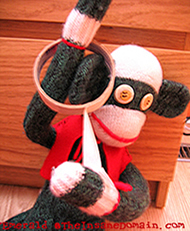 The first thing I have to do once I get up is play with one of my favourite things--sticky sticky tape! I love it. I think I love it a little too much. he he! 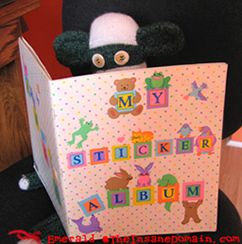 When McDiablo adopted me, she gave me this as a present--her old sticker album! I'm planning on filling up all the pages with my own stickers someday. 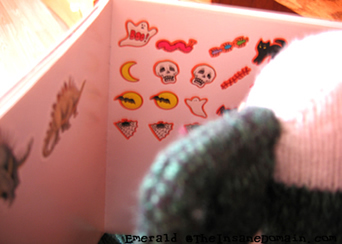 Since Hallowe'en is one of my favourite holidays, this page of spooky stickers is one of my favourites in the album. After looking at stickers and playing with sticky tape, I'm usually very excited and energetic. What does this mean? 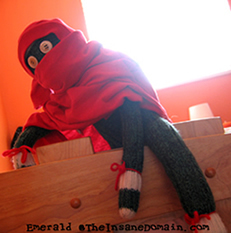 Red Ninja Sock Monkey Time! 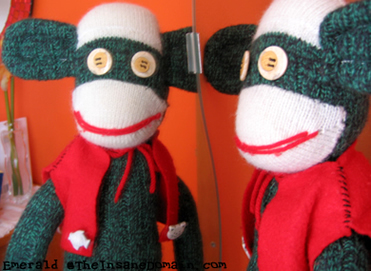 mild-mannered sock monkey to NINJA! 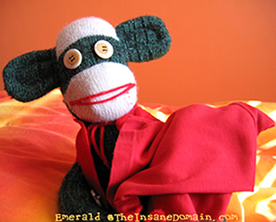 Don't tell McDiablo, but this is one of her T-shirts I'm using as a mask. 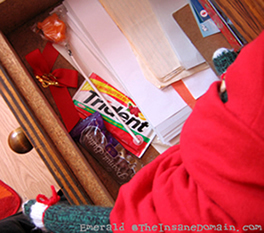 After ninja-ing around, I came upon McDiablo's candy stash! Wow, a lolipop, a package of gum and a CHOCOLATE bar! Jackpot! Oh, um, hi, McDiablo. 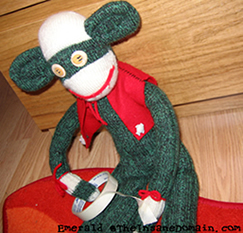 Shoot, I was caught red-handed! 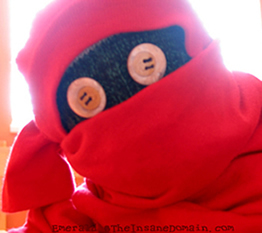 In a red mask, no less. I'm in trouble now! 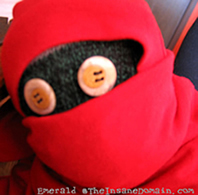 I need to work on my sneaking skills, I think. Sent to the corner. How embarrassing. After my punishment was over, it was back to climbing things. I love climbing! I really miss the summer weather because that's when it's so fun to climb trees. 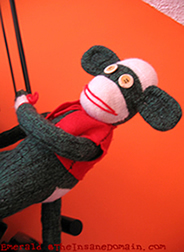 Dangling from high places is pretty fun, too. 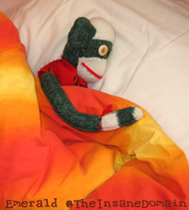 Well, that's all for now, everyone. 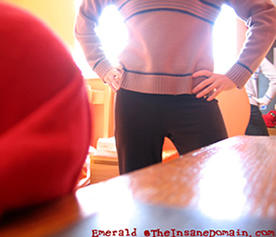 Here's hoping McDiablo doesn't move her candy stash. So long! 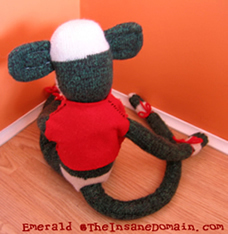 Back to Sock Monkeys : Go ask Emerald an insane question!